Here's where to watch every episode of Mrs Brown's Boys season 2. Mouseover or tap an episode to see where to stream it. Click or tap the play icon to stream it on the best available service. 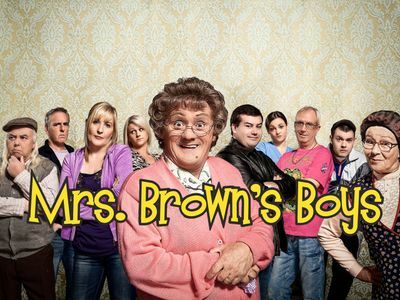 Mammy Pulls It Off Dec 31, 2011 Agnes Brown’s son, Dermot, and his new wife, Maria, have a baby on the way, and they are desperate for a place of their own, as the smash-hit comedy written by and starring Brendan O’Carroll continues. The newlyweds just can’t afford to move out, but Mrs Brown has a plan to help her son. Loving mother that she is, Agnes has promised the couple the money from Grandad’s life insurance policy payout for a deposit for their own home. There’s just one minor hitch – Grandad is not dead. Caught between a suspicious insurance company and her God-fearing son, Trevor, Agnes has to resort to desperate measures to keep Grandad out of sight and her dream alive. Mammy's Coming! Jan 7, 2012 Agnes is upset that her son Trevor has been called back to the missions in Africa, but is determined to give him a massive send-off to remind him what a loving family he has back home in Ireland. Meanwhile, daughter Cathy's family counseling session descends into chaos, and Buster and Dermot run into trouble with a circus lion. The only person having a good day is neighbour Winnie: thanks to his new medication, her husband Jackos's libido is back. But while Winnie delights in reminiscing about her former bedroom antics, Agnes makes a shocking discovery. iMammy (Batteries Not Included) Jan 14, 2012 Baby fever hits the Brown household as a pregnant Maria prepares for motherhood, and Agnes is keen to give her new daughter-in-law her unique brand of advice about raising children. Maria is grateful when Agnes offers to look after the robot baby she has brought home from her pre-natal class, but it turns out that Mrs Brown's babysitting techniques are not exactly orthodox. And Maria has some exciting news for the Brown family. SuperMammy Jan 21, 2012 When Agnes's family start making comments about her weight, she decides to go on a diet, and quickly discovers just how difficult it is to overcome her craving for fish and chips. Cathy brings her new, older man home. He is a psychiatrist, and seems much more interested in Agnes than he does Cathy. Meanwhile, Rory has a professional dilemma when he discovers some illegal drugs at work. Mammy's Going Jan 28, 2012 Spartacus, the old family dog, is looking poorly. Reluctantly, the family decide the time has come to put her in a home. However, when the Brown children gather together to decide how to break the sad news to their mother, Agnes gets the wrong end of the stick. Under the impression that her children are planning on putting her in a nursing home, a furious Agnes sets out to persuade her children she is not going senile. New Mammy Jan 28, 2012 There is bickering aplenty in the Brown household, as Rory and Dino are on the rocks and Agnes and Betty rub each other up the wrong way. With Maria about to give birth, Cathy convinces Agnes to build bridges and invite Maria's mother Hillary out for dinner. However, the night comes to an abrupt end when Maria goes into labour. Can the family get Maria to the hospital in time?